Andoversford, Gloucestershire: The Whittington Press, 1977. Limited to 200 copies (this no. 56) signed by James Reeves and Edward Ardizzone (total edition of 250). Fine in slipcase. Limited to 200 copies (this no. 56) signed by James Reeves and Edward Ardizzone (total edition of 250). Quarto. xii, 48p. Illustrated by Edward Ardizzone in monochrome lithography on Arches paper. Bound by Weatherby Woolnough in patterned cloth with oval paper title label on upper cover, t.e.g. 1978-11-13. Good. Ships with Tracking Number! INTERNATIONAL WORLDWIDE Shipping available. May not contain Access Codes or Supplements. May be ex-library. Shipping & Handling by region. Buy with confidence, excellent customer service! (Gloucestershire, UK 1977): The Whittington Press. Limited Edition. Quarto. 48pp. #72 of 200 copies signed by author and artist. illustrated Edward Ardizzone, bound in an attractive pink and cream decorated cloth, paper label to upper board, fine in paper covered slipcase with sun fading to edges. London: Heinemann, 1978. 1ST EDITION, 1ST PRINT. Book in super condition. Lyrical adaptations of Ovid's Metamorphoses, lavishly illustrated with the accomplished Ardizzone's line drawings. Includes 'Pyramus and Thisbe', 'Pan and Syrinx', 'Echo and Narcissus', 'Arachne' and 'Callisto'.. First Edition. Hard Cover. Very Good/Very Good. Illus. by Ardizzone, Edward. 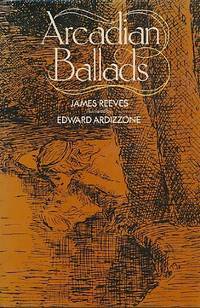 ARCADIAN BALLADS: Illustrated by Edward Ardizzone. London: Heinemann, 1978.. First edition. 4to. Cloth. 48 pp. Fine in a fine jacket. Published by Heinemann Educational Books, 1978. 1st thus edition.. Hardback. Fine/Very Good. Illustrated by Ardizzone, Edward. Fine condition in a nearly fine dustwrapper. Tall format. Brown cloth, gilt title to spine. B/w illustrations. 48 pages. Minimal rubbing to wrapper edges. Published by Heinemann Educational Books, 1978. 1st thus edition.. Hardback. Very Good/Very Good. Illustrated by Ardizzone, Edward. Slightly better than very good condition in a nearly fine dustwrapper. Tall format. Brown cloth, gilt title to spine. B/w illustrations. 48 pages. Erased pencil mark to top of front endpaper. A little foxing to edge of text block. Contents very good. Spine of dustwrapper a little faded and rubbed. Heinemann Educational Books. Hardcover. 0435147722 Light wear. Dust jacket and book are clean, has a good binding, no marks or notations. . Very Good. London: Heinemann, 1978. 48 pp. B/w illustrations.. Second edition.. Hard Cover. Book good/Jacket. Illus. by Edward Ardizzone. London: Heinemann, 1978. A near fine copy in a similar dustwrapper. 4to. 48pp. Black and white illus. by Ardizzone.. First Unlimited Edition. Illus. by Edward Ardizzone. Heinemann Educational Books, 1978. This is an ex-library book and may have the usual library/used-book markings inside.This book has hardback covers. In good all round condition. No dust jacket. Library sticker on front cover.